“An overwhelming level of interest among trade visitors, crowds of people at our booths, numerous high-level meetings, various contracts signed, and an award from Russian Railways – that sums up InnoTrans 2016 for Knorr-Bremse,” says Klaus Deller, Chairman of the Executive Board of Knorr-Bremse AG and responsible for the Rail Vehicle Systems division. On five booths covering 800 square meters, Knorr-Bremse presented a broad cross-section of its product portfolio. Among the prominent visitors to the booths were Alexander Dobrindt, German Federal Minister of Transport and Digital Infrastructure, and the Chairman of Deutsche Bahn AG, Dr. Rüdiger Grube. 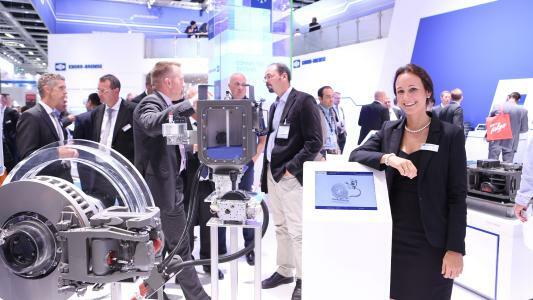 Trade show visitors showed strong interest not only in the latest brake control systems, bogie equipment, connectivity solutions, and new air supply system from Knorr-Bremse, but also in the systems showcased by the Group’s subsidiaries. Examples here included the new entrance system for mass-transit applications presented by IFE, with opening and closing times of less than two seconds, as well as the adaptive HVAC system for light rail vehicles displayed by Merak. This system automatically adjusts its output to the volume of passengers in the vehicle, thereby ensuring optimum energy efficiency. This trend was reflected in two agreements with Nedtrain that were signed at the fair. Nedtrain is responsible for the maintenance and inspection of trains operated by Dutch Railways. The agreements cover a development partnership focusing on the condition monitoring of oil-free compressors using iCOM Monitor, as well as a shop-in-shop concept complete with exchange of experience and staff training. Irrespective of the vehicle platform, this application enables operators to carry out costeffective, condition-based and preventive maintenance on their fleet of vehicles as required. During the fair, Knorr-Bremse’s Russian subsidiary Knorr-Bremse 1520 received an award from Russian Railways (RZD) for the KAB60 distributor valve. The KAB60 valve is specifically designed to meet the requirements of the GOST standard and is installed in newly developed RZD vehicles. RZD honored the valve’s performance and contribution to cutting life cycle costs with a “Best in Quality, Components for Rolling Stock and Infrastructure” award.